Posted by Twin Cities Habitat for Humanity on 1:03 PM on May 10, 2018 . 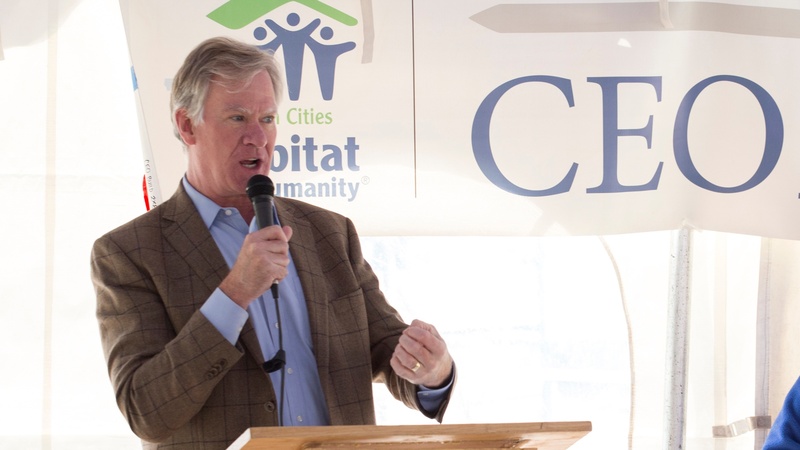 The Twin Cities Habitat for Humanity Board of Directors announced today that it has selected former St. Paul Mayor Chris Coleman as our new President & Chief Executive Officer. As Mayor of St. Paul from 2006 to 2018, Coleman was a champion for economic development, education, and racial equity. While in office, he envisioned and carried out major economic development projects, including the Central Corridor Light Rail, CHS Stadium, Palace Theatre, and Allianz Soccer Stadium. Coleman prioritized significant expansion of housing and led the fight to ensure that 20% of all new housing units constructed using public resources would be affordable to low-income residents. In his new role, Coleman will lead Habitat through the second half of its innovative and ambitious four-year strategic plan, Impact 2020. The top priority of the plan is to more than double the impact of the Homeownership Program. Coleman will guide fundraising and strategic planning efforts, expand public, private, and community partnerships, and advance the organization’s commitment to equity and inclusion. Coleman will replace Susan Haigh, who is retiring after leading Twin Cities Habitat for more than 13 years. Under Haigh’s leadership, the organization formed a historic $98M mortgage financing partnership with Bremer Bank, executed two successful fundraising campaigns, constructed its New Home for Habitat on University Avenue, launched new Advocacy and Neighborhood Revitalization programs, and opened two ReStore Home Improvement Outlets. Following Haigh’s retirement announcement in January 2018, the Twin Cities Habitat Board of Directors formed a Search Committee and engaged the executive search firm CohenTaylor to support recruitment. The robust, national search for a new leader garnered significant interest in the position. Robyn Bipes-Timm, VP, Loan Fund & Mortgage Lending; President, TCHFH Lending, Inc. Underlying Coleman’s leadership style is the conviction that every decision is a statement of one’s values. That conviction is clear in the city’s public investments—in jobs, housing, and economic vitality, arts and culture, out-of-school time learning, environmental sustainability, and parks and trails. With Coleman as Mayor, the City of St. Paul improved its hiring and procurement practices to create a workforce that mirrors the city’s diversity and to break down historic barriers to doing business in the city. From 2013 to 2014, Coleman was the President of the National League of Cities, a bi-partisan coalition of leaders from across the country. During that time, the group advanced efforts around education, environmental sustainability, and public infrastructure. Prior to his election as Mayor, Coleman was an investment advisor for RBC and he served for six years on the St. Paul City Council. Coleman was born and raised in St. Paul and earned bachelor’s and law degrees from the University of Minnesota. He and his wife, Connie, have been married for 29 years and they have two adult children, Molly and Aidan. The primary objective of Impact 2020 is to more than double the number of families who can partner with Habitat to achieve homeownership. In previous years, Habitat partnered with an average of 50 families per year on homeownership. The plan will more than double that volume, to create more than 100 homeownership opportunities annually. Impact 2020 was catalyzed by a historic partnership with Bremer Bank, which committed to buy Twin Cities Habitat’s mortgages at a below-market rate. The partnership is valued at more than $98 million. Philanthropic donations and public funding unlock the power of Bremer’s partnership and make Habitat’s mortgages affordable for families. Families pay their monthly fixed-interest mortgages to ensure more families can buy homes, too. The strategic plan introduced new ways for families to achieve homeownership. In addition to buying homes built or rehabbed by Habitat, households now have the option to buy a home for sale on the open market using Habitat’s affordable mortgage, originated by a new wholly-owned subsidiary, TCHFH Lending, Inc.
Other Impact 2020 strategic initiatives include opening additional ReStore Home Improvement Outlets, offering financial coaching to help households achieve mortgage-readiness, deepening the A Brush with Kindness paint and repair work, and piloting an Age in Place program for seniors. Our mission is to eliminate poverty housing from the Twin Cities and to make safe, decent, affordable shelter for all people a matter of conscience. Twin Cities Habitat is committed to building the quality of life, health, and economic prosperity of the region by producing, preserving, and advocating for affordable homeownership – because homes and families are the foundation of successful communities. Since 1985, more than 1,200 families have partnered with Twin Cities Habitat to achieve homeownership, building stability that multiplies for generations. Twin Cities Habitat is recognized as an Affiliate of Distinction and is one of the highest-regarded Habitat for Humanity affiliates nationwide. www.tchabitat.org.